Future residents of Village Hill Cohousing with the agreed-upon preliminary site design. Cohousing isn’t for everyone — for example, people who just want to be left alone should probably take a pass. But for individuals and families who crave a balance between privacy and community, it can be a highly attractive proposition. Kraus & Fitch Architects and Transformations Inc. have been hard at work designing Village Hill Cohousing in Northampton, but they haven’t worked alone; future residents have plenty of input in what promises to be an intriguing, collaborative, ultra-energy-efficient development. Peggy Gillespie loves her home in Belchertown. But the 67-year-old widow plans to move to Village Hill Cohousing once the development is built on the grounds of the former Northampton State Hospital, and has been attending meetings for the past year with other prospective residents. Deborah Schifter shares similar feelings, but finds the community particularly attractive for environmental reasons. When she was in her 20s, she lived on a kibbutz in Israel and enjoyed the camaraderie in the close-knit community, as well as the fact that people with diverse talents shared responsibility for its upkeep. But one of the most prominent selling points of Village Hill for Schifter is that every structure in the neighborhood will be a zero-net-energy building. “We’re heading into a time that will be very different due to climate change, and sustainability and living in a community with people who are knowledgeable about energy resources are among the things that appeal to me,” she said. The women belong to a group of 15 future residents who have put down a $5,000 deposit to pay for architectural fees for the new development. They come from diverse locations — local towns and cities, the Boston area, Cape Cod, New York, New Jersey, Florida, even Saudi Arabia — and attend frequent meetings held to ensure their wishes are taken into consideration during the design phase of the project. The initial plan for the anticipated community came about as a result of a collaboration between Amherst-based Kraus Fitch Architects Inc. and Transformations Inc., which was awarded a contract by MassDevelopment to create Village Hill Cohousing on the last remaining large parcel of land slated for residential use on Village Hill. Transformations President Carter Scott said his firm submitted a plan in response to a request for proposals for the 41-acre site, which contained a letter of intent from Kraus Fitch Architects and a drawing of the proposed cohousing neighborhood created by architect Laura Fitch. 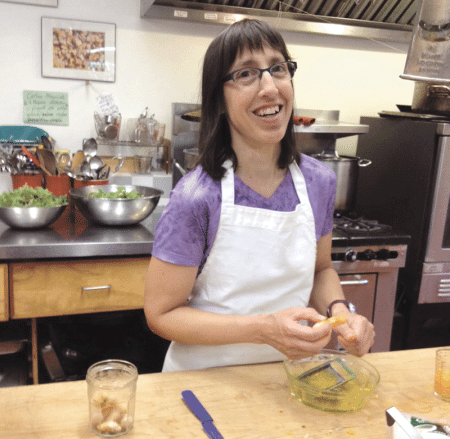 Mary Kraus cooks dinner for residents in her cohousing community, where members share a meal several times a week. However, in addition to the cohousing neighborhood, the plan includes construction of 53 units of conventional housing in a different section of the tract that will be designed by a different architect. Both neighborhoods will be within walking distance to downtown, but the cohousing development will be unique. It will contain a spacious parking lot, 10 duplexes, and 12 single-family homes ranging in size from about 700 to 1,600 square feet, with space for a community garden. However, the most important structure will be a 4,600-square-foot common house, where members will likely share meals several nights a week. Its interior will boast a gathering room with a kitchen and dining area large enough to accommodate all of the residents, as well as a children’s playroom, an exercise room outfitted with equipment, a game room, a guest suite with two bedrooms, and storage space. Principal architect Mary Kraus says her firm is one of a handful in the country that specializes in cohousing and sustainable design, and has been involved in at least 30 of these developments. In the past, groups with established goals came to them when they were ready to establish a new community, but Village Hill is unique because, when the idea was conceived, they had no idea how much interest it would generate. So she set about marketing the proposed neighborhood long before MassDevelopment awarded the contract to Transformations. “We held three informational meetings, which were highly successful. They attracted about 130 people,” she said. Scott added that enthusiasm soared when he mentioned he planned to build zero-net-energy homes in the community. “People at the meetings broke out in spontaneous applause, which was really exciting. And one of the Planning Board members got tears in his eyes when he looked at the plan,” he recalled, adding that an e-mail list of interested people was created during the meetings. After a group of individuals and couples expressed a decided interest in the community, Kraus began the process of getting them together to solicit information about their values and goals. “These things are important, but the meetings involved more than what was addressed; our goal is to help the group build a social community while they are designing their physical community,” she told BusinessWest, adding that gatherings can be stressful due to differing viewpoints. 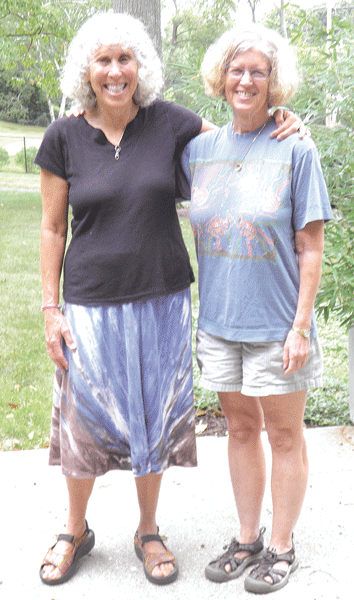 Peggy Gillespie, left, and Deborah Schifter are among a group of individuals actively involved in the planning of Village Hill Cohousing. Kraus sent out an online survey prior to each session, which included questions and recommendations pertinent to the topic. The responses were analyzed, and once areas of agreement and divergent opinion were identified, the agenda was tailored to focus on areas that needed to be resolved through discussion. And there were definitely differences of opinion. “Some people wanted an exercise room in the common house, while others wanted a meditation room,” Schifter said, explaining that they compromised when they realized an exercise room was needed to house equipment, but a multi-purpose space could be designed to feel contemplative. Other issues included the number of pets a person could have and what the owner’s responsibility would be in monitoring their behavior. During one workshop, group members were given small building blocks so they could simulate the layout of their community, which changed as they moved tiny structures around the table. “But by working together, they built relationships and dealt with their fears as well as interpersonal challenges,” Kraus said. The workshops began last August, and a basic design was completed by the end of last winter. Members continued meeting on their own after that, and today, a membership committee, design group, communication committee, and facilitation committee have been formed. Kraus said the facilitation process that fostered goodwill and built consensus for their cohousing clients can be used in a wide range of business situations, such as creating a design for a large stakeholder group or helping a company improve their decision-making process while fostering positive working relationships among their staff members. Ground is expected to be broken next spring for the zero-net-energy community, and Scott is excited about it. He is on the governor’s Zero Net Energy Building Advisory Council, and cited a long list of prestigious awards that Transformations Inc. has received for its work in this arena, including the Northeast Sustainable Energy Assoc. Public Impact Award for building more zero-net-energy homes than any other member. “In 2012, we built two homes that produced enough energy to drive an electric car 30,000 miles per year,” he noted. “But we will be able to go much further on the sustainability curve with this cohousing project because we are not building on spec, but for a group of ecologically minded people. This new neighborhood on Village Hill promises to be an attractive addition to the former state-school property, which has been transformed into an oasis with a wide variety of housing options. The combination of many positive factors, including a close-knit community, have caused Scott and his family to consider moving there. “We haven’t made a decision yet, but it’s a nice way to live,” he said. Gillespie agreed. “I think people are longing for this type of environment. They miss knowing their neighbors and being able to interact with them on a frequent basis. 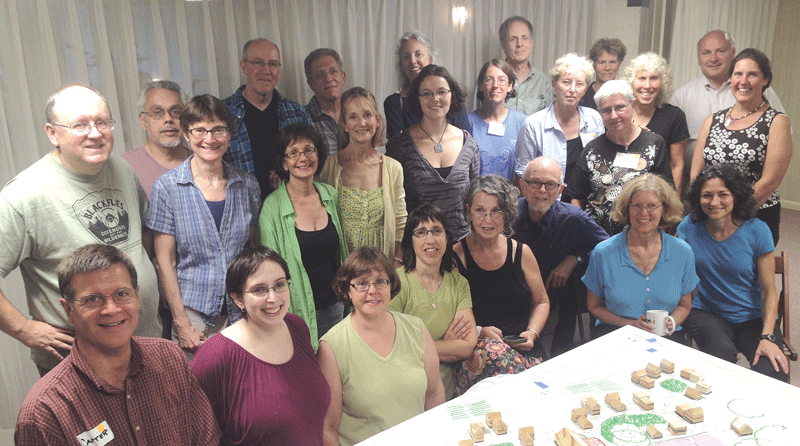 Village Hill Cohousing will have a nice environment and be a great place for people,” she said. Kraus and her husband have lived in Pioneer Valley Cohousing in Amherst for 21 years and love being part of a close community. Chart of Area Colleges with MBA Programs in Western Mass.